AMMA pays its respects to George Polites AC CMG MBE, one of the most passionate and effective advocates of Australian industry of the 20th Century, who passed away peacefully at 100 years of age on 5 February 2019. Mr Polites spent his entire working life advocating for Australian employers and the benefits healthy and growing industries would deliver to the broader community. After working for peak industry bodies during the 1940s and 1950s, he was appointed Executive Director of the Australian Council of Employers Federations in 1960. In 1977, he was the driving force behind the ACEF’s amalgamation with the Associated Chambers of Manufactures of Australia to form the first unified peak body for all Australian business sectors – The Confederation of Australian Industry (CAI), of which Mr Polites was appointed Director General. He would hold this position at the apex of employer representation until 1983. During this time, the CAI became recognised as the employer equivalent of the Australian Council of Trade Unions (ACTU), while Mr Polites’ negotiation skills, political acumen, passion and effectiveness saw him likened to then-ACTU leader Bob Hawke. 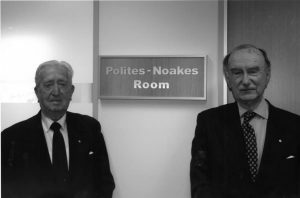 Later as Prime Minister in 1984, Mr Hawke would award Mr Polites a Companion of the Order of Australia (AC) for his services to the Australian community. Mr Polites was also awarded a Companion of the Order of St Michael and St George (CMG) by Malcolm Fraser in 1977 and a Member of the Most Excellent Order of the British Empire (MBE) earlier in the 1960s. In 1992, the CAI would merge with the Australian Chamber of Commerce to form the Australian Chamber of Commerce and Industry (ACCI), which remains the nation’s largest and most representative business association. AMMA Chief Executive Steve Knott said Mr Polites would be remembered as “the father of modern-day business representation in Australia”. “George was a fierce industry advocate but also an astute and effective negotiator. He was the business community’s answer to Bob Hawke and equally highly respected by all social partners,” Mr Knott said. AMMA offers its condolences to Mr Polites’ family and friends.